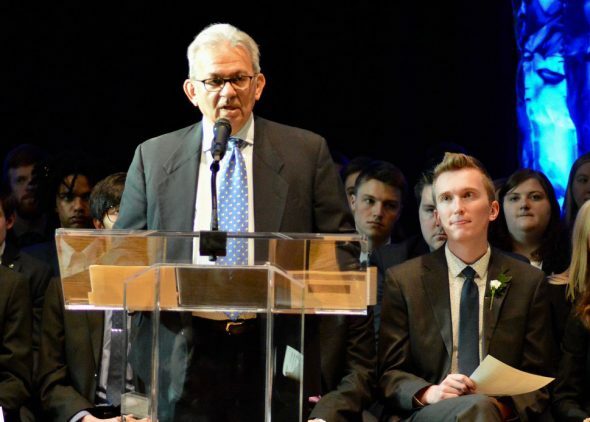 Suku Radia, retired president and CEO of Bankers Trust and a member of Drake University’s Board of Trustees, speaks at the College of Business and Public Administration’s annual awards ceremony. Nearly 850 people gathered to celebrate the accomplishments of students, faculty, and community members during the College of Business and Public Administration (CBPA) annual awards ceremony on April 18. The college issued dozens of awards, including honors for the CBPA’s top junior and senior students of the year and undergraduate and graduate teachers of the year. Drake University Board of Trustees member Suku Radia, retired president and chief executive officer of Bankers Trust, was the ceremony’s keynote speaker and recipient of the CBPA Community Leadership Award. Radia retired from Bankers Trust at the end of 2017 after holding the CEO position since March 2008; previously, he built an impressive career with KPMG and then Meredith Corporation, all while showing a remarkable commitment to giving back to community organizations throughout Central Iowa. He is highly active in a number of additional professional, economic development, educational and charitable organizations. He has chaired many committees and boards such as the recent Solheim Cup Tournament, United Way of Central Iowa, Community Foundation of Greater Des Moines, Mercy Medical Center, and the Greater Des Moines Partnership. His many awards and honors include the Robert D. Ray Pillar of Character Award, United Way’s Tocqueville Society Award, inducted into the Iowa Business Hall of Fame and several honors from the Business Record. The awards ceremony recognized dozens of students for their accomplishments in academics, leadership, and community involvement. Twelve seniors were honored for maintaining a perfect 4.0 grade-point average throughout their academic career. Linda Fiorito of Overland Park, Kan., was chosen as the CBPA Junior Student of the Year. A marketing major with an academic minor in graphic design, Fiorito has completed an internship with the Robert D. and Billy Ray Center during her time at Drake. She is a member of the women’s soccer team, earning MVC Scholar-Athlete Honorable Mention honors; a member of the Student Athlete Advisory Committee; and a Seeds of Success student athlete mentor. She also is a member of Drake’s American Marketing Association chapter and a CBPA tutor. She will intern this summer at Sporting Kansas City. Haley Morris of Clive, Iowa, was selected as the CBPA Senior Student of the Year. Morris plans to graduate in May with bachelor’s degrees in marketing and advertising. She has completed internships with the Drake University Athletic Department, Unite Midwest, the Healthiest State Initiative, Meyocks, and Blue Compass. She spent a January Term in Guadalajara, Mexico, and a summer term in Poland, Germany, Thailand, Spain and the Czech Republic. She is a member of the Drake women’s soccer team and was named the 2017 Missouri Valley Conference Goalkeeper of the Year, an All-MVC First Team selection and a member of the MVC Scholar-Athlete First Team. Also during the CBPA awards ceremony, numerous faculty members were honored for their hard work for the CBPA and Drake community. Highlights included top honors for undergraduate teaching and graduate-level teaching. Susan Watson, assistant professor of practice in actuarial science and director of the School of Actuarial Science and Risk Management, was selected as the David B. Lawrence Outstanding Undergraduate Teacher of the Year. Watson joined the CBPA full time in 2014. Within the college, she has taught a variety of actuarial science and statistics courses. Brad Meyer, associate professor of information management and business analytics, received the Outstanding Graduate Teaching Award. He joined the CBPA in 1989. He teaches a wide variety of graduate courses within the college, especially within the Master of Business Administration courses.